“We want to go viral!” says the chief communications officer. “Can’t help you” used to be our standard answer. But by doing this, we’ve left social media in the hands of marketers and self-appointed “gurus” more concerned with Klout than user needs. It’s about time we reclaimed social media. But social has its place—and it is tied to so much of the work we already do. Whether you are working to increase conversions, looking for an additional source of user research, or want to enforce a consistent brand, social media should be part of your toolbox. In most organizations, social content is the messiest content there is, with (even more) distributed ownership and few strategic imperatives besides “get more likes.” Such organizations are in dire need of your governance skills. The first step is to take an inventory of your social channels. Most companies have tried to participate in every new channel in search of “the next big thing.” There may not have been much of a strategy beyond uploading your logo to another new service. How many social media accounts does your organization have? (You might even find several accounts on the same service). Create a spreadsheet and list all your channels. Add a column for who controls each account (the answer might be “no one”). Do you have the passwords to all the accounts? Which email was the account registered to? Add that information. Make sure that all the accounts are registered on a company email like socialmedia@yourcompany.com, not to your intern’s personal gmail. Other useful spreadsheet columns might identify the number of followers on each account and the account’s monthly budget. Way too often, success in social media is measured in likes, retweets, and reach. But how can you defend spending resources on these channels if you can’t explain how they’re connected to the organization’s bottom line? You need to ensure that your social media channels will be working in symphony with your other channels, as well as in line with the organization’s overall strategies. To do that, you should create goals that are specific yet channel-agnostic, such as increasing sales, increasing customer satisfaction, reducing costs, and so forth. These are truly channel-agnostic goals, which also means that there’s no need to come up with completely new KPIs with every new social channel that pops up. After you’ve decided on overall goals, subgoals, and KPIs, you need to decide which specific channels should be used for which goals and which audiences. The users you decide to target on social media might—and probably should—differ across channels, and even differ from your website. It just depends on your business goals and where your target groups are. For instance, Plan International uses Twitter to target journalists, politicians, and opinion leaders to reach their goal of influencing public policy. On their website, however, their biggest target groups are potential donors and existing donors, to reach their goals of increasing earnings. Social media has so many different but overlapping use cases that there’s usually an ongoing battle about who should be in charge of it. Marketing? Communications? IT? HR? Customer service? Sales? And what about the lawyers who keep sticking their noses in our business? Because of this, each social media channel needs to have an owner. This owner has a mandate to control the channel in the way they believe will most effectively reach the goals and KPIs that have been ratified by management. This person is in their absolute right to say “No” when someone says, “We need you to get this on Facebook right now!” if it isn’t clearly connected to the ratified strategy. Channel ownership is not enough, however, if you want to use your digital channels to their full potential. Someone needs to make sure that the channel owners collaborate and work in line with the strategy. In some organizations, we’ve dubbed this role “channel coordinator.” Whatever the title, the main point is that they’re making sure the digital channel strategy is implemented on a day-to-day basis. In practice, much of social media work is trying to write the right tweet at the right time—always in a hurry. You can avoid the last-minute panic by planning your posts ahead of time. Some weeks, you may get bombarded with requests for posts; other weeks, you may roam the web for interesting tidbits simply to post something. An editorial calendar can help keep your content in balance. To identify important dates throughout the year, talk to your colleagues in other departments. What are the biggest events, milestones, and campaigns for marketing, customer service, communications, and so on? What holidays and external events might impact social media involvement? Organize these dates and events in a spreadsheet. When you have identified all the important dates, you will be one step closer to determining what your most important social content will be. If there will be a big summer campaign, what will you tweet when you launch it? Do you need to order some special content in advance, like videos or infographics? As you can see, their yearly plan includes events that matter to the university—like the Abel prize—and events that revolve around user needs—taking exams and getting grades. Remember, social media is a push medium. You cannot push content when your audience is not ready to receive it, like interesting science news when everyone is gone skiing during the holidays. An editorial calendar that takes all these different dates into account can help you determine when your audience might be most receptive to your messages. The yearly plan lets you prepare for the bigger milestones, but a weekly plan helps you manage day-to-day details: which channels should we use, what do we want to achieve, and how should we measure success? A plan like this makes it easier to craft your posts. You don’t have to scramble at the last minute to come up with ideas. You can make sure you have the pictures you need in advance. By keeping an eye on KPIs, you can track what kind of content your audience responds best to. Okay, you’ve cleared the clutter. You’ve made a plan. You know what to write about when and where. But how do you create great social content? Yes, you can improve your writing in five minutes. The secret is writing with a partner, which does wonders for all kinds of copy. (This article was pair-written!) Writing with a partner helps give your copy a more consistent tone of voice. It’s also the quickest way to spot weak copy and avoid writer’s block. Pair writing is an opportunity to teach and learn better copywriting without sending a draft back and forth. Could you appeal to emotions? If not, can you make it useful, funny, or identity-enhancing? Is it in line with our tone of voice? Don’t post just to “inform” or “share” something. You should never start composing a post if you don’t really know why you’re doing it or how it will meet your users’ needs. This is where our approach to social media connects to the core model approach. A core is a piece of information or functionality where your users solve their task, and you reach a business objective. With a social media post, the key question is: is this post a forward path to something else or a core itself? For example, if you want people to buy tickets for your conference, you’ll likely create a post that is a forward path to other content. You want people to click that link so they can purchase tickets, not just read or like the post. Adding a photo of a cute kitten might get you more likes, but it might be counterproductive as a forward path. 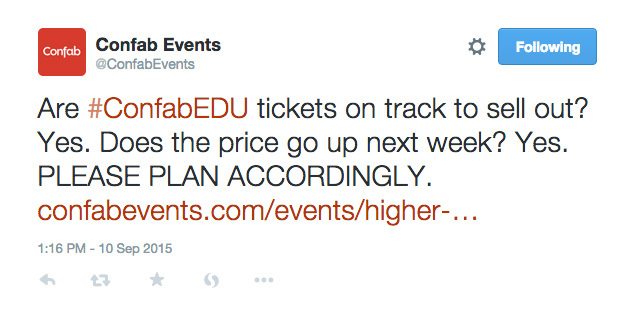 This tweet from Confab Events is a good example of a forward path to their core content. If the post itself will solve user needs and help you reach your objectives simply by being perceived by your audience, then the post is the core. 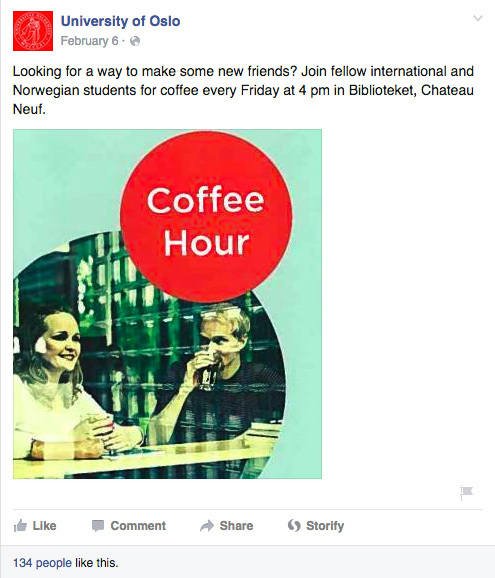 For example, one of the University of Oslo’s objectives is to help international students feel at home, so they post their event info directly to Facebook, where international students are more likely to see it, instead of on their website. This post from the University of Oslo is core content by itself: the user gets all the information they need. There is no need for further interaction. Twitter has already forced you down to 140 characters or less, but you should strive for brevity in all channels. You might think you have almost limitless characters on Facebook, but remember that Facebook cuts you short with the so-called blue link of death if your post is too wordy. Don’t lose your content behind a “See More” link. Clarity is especially important if you are sharing a link. Users will read your post squeezed in between other posts that might be a lot more interesting than what you’re offering—clarity helps your link stand out in the feed. The title, the description, and the thumbnail photo should be as clear as possible. Can you tell what the content is about just by reading the excerpt? (Remember that people who share your link will often not bother to add their own commentary). Sharing is not a question of positive or negative emotions. Intensity and effect are more important. If you want to entice people to share or comment, try to evoke emotions that speed up pulses and make people lean closer to the screen: amazement rather than amusement, surprise rather than mere interest, and so on (as demonstrated by academic research). To share your content, users have to feel comfortable interacting with your content in front of their own channel audience. Appealing to emotions can be useful, but it’s not always appropriate for the context or your brand. Instead, it may be more helpful to share content that allows people to demonstrate their knowledge—for instance, content that lets them debate a topic they are publicly engaged in. Humorous content might also appeal to sharing behaviors; humor can make people feel less nervous about sharing more sensitive topics. Study your copy and ask: Would my users feel comfortable sharing this? One of the benefits of writing posts in advance is being able to plan the timing. Use analytics to see when your audience is most active, check your editorial calendar, and choose topics that will resonate for maximum impact. 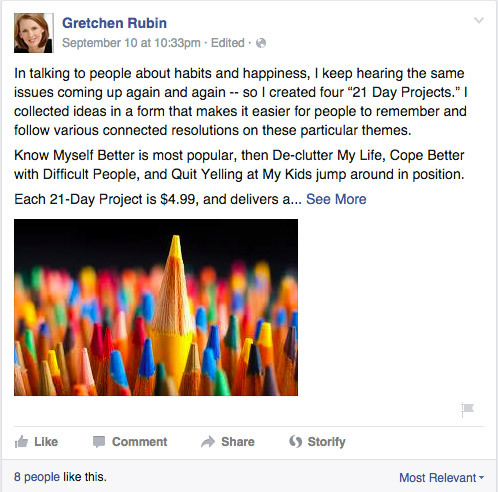 If your target audience has regular jobs, posting during lunch hour might be perfect. But if you are writing for students, posting late at night might not be such a bad idea. Many people still treat their company’s social media channels like we treated our own private accounts in 2009: they get an idea, they post it, they refresh and look for likes, end of strategy. Others are slaves to the ever-changing algorithms of Facebook and lose sight of the long-term goals. If you take stock of your social channels, assign them key target groups, and establish channel-agnostic goals, you’ll have a head start on the competition. By allocating responsibility, creating a yearly plan, and drafting your posts in advance, your content will be more aligned with both your business goals and user needs. And, if nothing else, you can use pair writing and the seven questions to improve your next tweet straightaway. In the words of Kristina Halvorson: “The web is content. Content is the web. It deserves our time and attention.” That is true for social content as well. We hope you are ready to reclaim social from marketing. We know we are. Me & Ida J will be here to answer questions and discuss, of course! Thanks, what a great article, thoroughly enjoyed it. Yes! This article is dead on (and selfishly rather validating)! Thank you Ida and Ida. One thing it doesn’t mention – in taking this sort of strategic approach to social media, you’re able see exactly which type of users enjoy/engage with which content you’re creating, so there is an automatic refining process over time that’s really valuable. Most social media platforms have pretty good analytics baked in at this point. Social media sometimes can be frustrating for your audience if not done in a proper way. It has become so vital to consider as a part of your content strategy. Your profile on social media speaks about your identity so it is important to have a content that creates a positive identity. Usually, marketers prefer to use different social platforms independently but there must be a strong connection between the content which all of these platforms speak about. I also want to look into accessories but have yet to dive in as I’m unfamiliar with the twig templating system. Really great post that covers the basics and then some, one could get started with this info alone! One thing that I often see missing from these articles is the need to use quality links to keep your social media and marketing infrastructure healthy. Services like Capsulink offer editable redirects so if your pages ever change or move (more common than you’d think! ), you can simply edit your links instead of having to overhaul the whole lot. And of course there’s the typical short link features like traffic stats, password protection, etc. Its helpful and a unique idea of your admin.thanks social media it’s huge its getting bigger and bigger day by day. that’s why i’m leaving a great list of social media sites. Could you expand more on where does analysis fit into this process? Do you focus a lot on what your content does once it’s posted? I’m curious especially about link capsules, which I’ve been hearing a lot about recently. Specifically companies, like Capsulink (www.capsulink.com) – I see there could be a lot of benefits for analyzing the traffic. Do you have any experience with that? Thanks! social media can be the best source to drive traffic to our website. With the help of social media, we can give wings to our business and get more benefits.